Today I got up early to go to my fitness center to lift weights and swim laps. Afterwards I sat in the hot tub for about 15 minutes. Then I took a shower. It's my favorite workout routine. It leaves me feeling fit and refreshed for the rest of the day. It was my first workout in three months. This year our part of Texas had record high levels of tree pollen, and I had an allergic reaction to it. My sinuses got so congested that eventually I got an upper respiratory infection. Even with anti-biotics, the recovery took weeks. And just when I thought I was almost well, the whole thing started up again. And of course during all this I didn't feel like working out. It was like having a miserable cold for more than two months. After recovery, we spent over a week vacationing with friends in Tennessee. As soon as we returned, I had a minor out-patient surgical procedure, and the doctor told me not to lift anything or swim for two weeks. So it's been a long time. And yes, as a result, I lost conditioning. I couldn't pick up where I left off. I had to start over to build back my strength and endurance. There's no way to build physical strength without stressing the muscles. With enough exercise, tiny tears form in the muscles. In a few days they heal, making the muscles bigger and stronger, allowing you to do more work. Physical conditioning isn't about knowing something. It's about doing something. You gotta do the work. Personal strength-building works the same way. To make a behavior pattern stronger, you have to use it. The more often you use it and the more challenging the situations you attempt, the stronger the pattern will get. If you have opportunities to use the behavior pattern and you choose not to, you regress. Like physical conditioning, knowledge may get you to the gym, but you have to do the work. Nothing happens when you just think good thoughts. When building physical strength, it's best not to stress the whole body. That approach is neither healthy nor realistic. Instead, design a regimen of workouts that focuses on specific areas, and follow this plan until you eventually achieve your goals. Then you can work on other areas. The same principle of focus applies when building personal strength. Don't try to improve too much all at once. The best approach is to pick one area that you feel needs work and consciously begin applying the behavior pattern in your work and life. It's the equivalent of "going to the gym," which requires a real desire to improve and a commitment to follow though with the workouts. At the gym, it helps to have a personal trainer, someone to explain a proper workout, encourage you and remind you of what you should be doing. It would seem that this is where the analogy breaks down, because personal strength is a new topic and most life coaches aren't knowledgeable in this area. But my company's new product, ProStar Coach, is a virtual coaching service that focuses on building both leadership skills and personal strengths. Yes, it's really different. We just launched it the other day after more than two years of development, and we're excited! 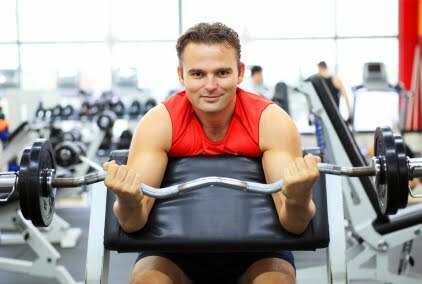 I know that not everyone goes to the gym, and not everyone will do workouts to build personal strength. But now there's a virtual gym for people who want to get stronger for life and work. And that's something nice for me to think about, sitting in the hot tub. Great post, Denny, and speaks truth. How many people do you know you talk about "working out," when you can look at them and just know they are reliving the memory of an old, good habit, not what they actually do today. Remember the old Eastern Airlines (now defunct, sadly) motto? "You've got to earn your wings every day." Glad to hear you have recovered from the surgery and that the allergy season is about gone for this year. I was allergic to our neighbors' hay in NC to the point that we just couldn't stay there anymore, so I can relate. Also, Buck's recent minor surgery left him unable to workout for about two months. He is slowly returning to his weights, walking and treadmills routines. We both find that as we get older, the recovery times lengthen. But the rewards of staying fit are many, varied and the only way I know to gain a little more time in this wondrous life. Congratulations on the launch of ProStar Coach! Denny -- meant to say "who" talk about -- not "you" talk about. I've either had too much coffee or not enough!